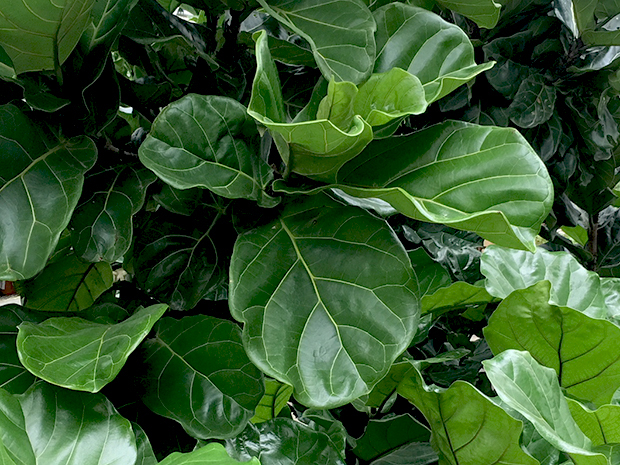 The Fiddle Leaf Fig | Faddegon's Nursery, Inc.
Jun 29, 2018 | Blog, Indoor Plants, What's New? Like many plants, this one goes by several names, Fiddle Leaf Fig being the most common which refers to both Ficus pandurata and Ficus lyrata. Yes! It’s actually a ficus tree. There’s no mystery about where it got its common name. The fiddle-shaped leaves. And what beautiful leaves they are. Dark, thick, and leathery, they can grow to larger than 12 inches across and the same in width. You won’t need to shine the leaves – they seem to have a natural shine. In the right spot, fiddle leafs are considered easy to grow. Space is something they value so don’t be too quick to press it in close to other foliage. This plant is also one of the great air purifiers. The bigger the leaves, the more toxins that are removed! Fiddle leafs require medium light when indoors. Most internet sites will tell you that high light is fine but we disagree! The plant can be placed right in an east facing window (morning sun) or a few feet away from a south facing window. Fiddle leafs like to go dry between waterings. Don’t think in terms of a watering schedule until you get to know your plant! Its environment will determine how often you water and even then the frequency will change with the seasons. Using a moisture meter is the best way to know when to water. Make sure the container has drainage! It’s essential. Otherwise, it will be impossible for you to see how much water or moisture has collected in the bottom of the pot but soon you’ll see a sickly plant and root rot. We recommend SuperThrive for all indoor plants. Feed once a month during the growing season and once every 2 months during the winter. Between 60 and 85 degrees. Healthy growth means that a Fiddle leaf will drop lower leaves from time to time.